Jaffa (AsiaNews / Agencies) - The Christian-Arab population of Jaffa (Tel Aviv) denounces continuing cases of religious and ethnic discrimination. The last case occurred on June 12 in the local Orthodox cemetery. 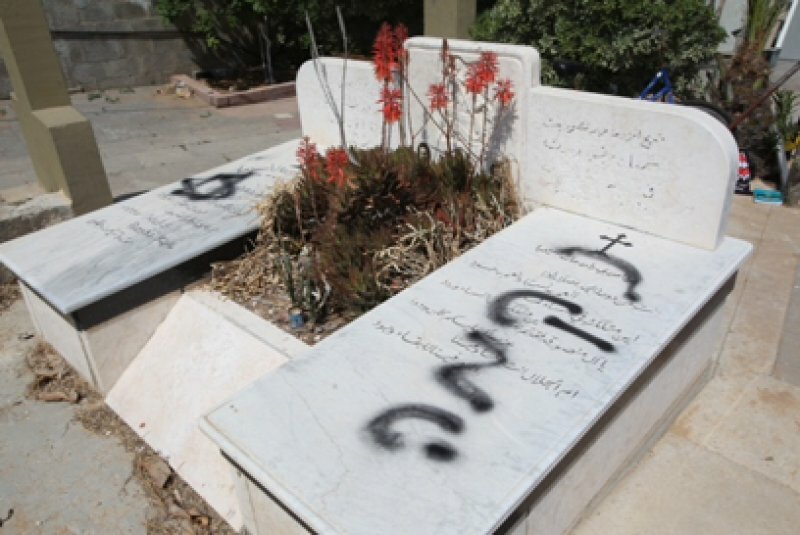 A group of vandals desecrated a number of tombs overnight and smeared the walls with slogans in Hebrew calling for "revenge" (נקמה) against Christians and the "price" (נמכר) they should pay for their acts against Jews . Graffiti with insults appeared on the house of Khaled Kaboub, district judge in Tel Aviv, situated not far from the cemetery. This is yet another case of vandalism against the Christian community, and residents point the finger at the city authorities who in recent years have ignored the problem without carrying out any investigations to arrest the culprits. Offensive graffiti cyclically appears on the walls and doorways of various Christian buildings in Jerusalem. On 31 May graffiti insulting Jesus appeared on the walls of the Basilica of the Dormition. Human rights activist Balha Ahmed says that "these are dangerous acts that are driven by hatred for the Arab residents of Jaffa." The "price to pay" is a motto used by Israeli extremists who threaten Christians and Muslims for stealing their land. Once the phenomenon was widespread only in areas on the border with the West Bank and Jerusalem. Today it also affects the great metropolis of Tel-Jafo. "Unfortunately - adds Balha - the government does nothing against this phenomenon, and this encourages other similar acts." According to some residents, if the incident had occurred in a Jewish cemetery the police would have found the authors within a few hours. All Israeli newspapers would have reported it. Asthma-Agbaria Zahalka, president of the Da'am party, the only Israeli party chaired by an Arab woman, explains that "the writings that refer to the 'price to pay' are used by extremist Zionists, especially settlers, often supported by the government itself. The government headed by Benjamin Netanyahu defends their safety and well-being at the expense of other citizens and rejects any peace negotiations with the Palestinians. " According to the woman, "the Jaffa incident shows that the boundaries between Israel and Palestine are becoming increasingly blurred." Jerusalem: seeds of the third intifada planted in the " King’s Garden "